Nadine Benjamin’s Outstanding Tosca Celebrates How Everybody Can! An exciting evening was had at St James’s Church in Piccadilly as a semi-staging of Tosca was performed to a full house. Anticipation was palpable and, judging by the standing ovation at the end, the audience were not disappointed by the valiant efforts of a group of enthusiasts who pulled together forces that, on occasion, could rival those of more established companies. This semi-staging of Puccini’s ‘shabby little shocker’ was the second production by Everybody Can! Opera, established by soprano Nadine Benjamin to ‘help provide a platform to encourage others to believe in themselves and support them in recognising that whatever they envision can be achieved.’ True to her word, this exceptional singer (who acted as producer as well as leading lady) put together a cast and creative team that included a number of people she has mentored alongside established professionals. It is impossible to argue with such good intentions but, unsurprisingly, it did make for a somewhat uneven evening in terms of performance and production. Italian bass-baritone Nico Laruina set the bar high with a well-defined and vocally-strong Angelotti, only to have the bar raised even higher by the luxury casting of Simon Butteriss as the Sacristan. This comic genius (who is currently singing the dual roles of Benoît and Alcindoro alongside Benjamin’s Musetta in ENO’s La bohème) brought his buffo character to life, demonstrating to his less-experienced colleagues a masterclass in how to inhabit a role. Spanish tenor Borja Gómez-Ferrer, who sang Roderigo in Everybody Can! Opera’s production of Otello in 2015, here stepped up to the principal – and demanding – role of Cavaradossi. His programme biography states that he has been retraining his vocal technique and discovering a more dramatic voice. He is obviously still on this journey of discovery, but nevertheless sang with a mixture of warmth and heroism that made for a passionate and plausible persona. What he seems to have uncovered is a voice of great potential and it will be interesting to see how this young tenor develops. The strongest vocal performance of the evening came from Nadine Benjamin in the title role. A recent addition to the ENO Harewood Artists’ programme, Benjamin has recently received critical praise for her portrayals of Clara (Porgy and Bess) and Musetta (La bohème), and to that acclaim we must now add this rendition of Tosca. Dramatically she showed all sides of Tosca – jealousy, love, passion, anger, revenge, strength – and vocally combined a clear-cut, full-bodied voice with a true beauty of tone. Her ‘Vissi d’arte’ literally stopped the show but was an honest outpouring of emotion and a heartfelt plea to God rather than an indulgence. This was an outstanding performance from a great singer portraying a grand diva. The role of Scarpia allows little room for character development, but David Durham’s credentials as an actor shone through. He showed a quiet menace rather than a caricature of pure evil and was a villain who clearly relished his position of power, arrogant in his self-belief as an invincible power. His stage presence carried slightly more weight than his voice which was not always heard over the orchestra, particularly in the Te Deum, but the quieter moment were sung well. The pivotal scenes with Benjamin in Act II exuded great tension and were a particular highlight. Another young tenor with a promising future, Jonathan Cooke was Scarpia’s henchman Spoletta, and made his mark. In the smaller roles, Nicholas George was Sciarrone, Douglas Lee the Jailer, but a special mention should be granted to the soprano Danae Eleni, who sang a sweet-sounding Shepherd girl (in this production, a homeless person), a successful switch from the usual casting of a boy treble. This change was one of the elements of a contemporary semi-staging that made sense, though not all the ideas presented by director Rebecca Louise Dale worked as well. The updating of the setting from early 19th-century Rome to present-day London did not seem necessary. If the intention was to make Tosca more relevant to its audience, I am not convinced it succeeded. Puccini made it clear in the score that having murdered Scarpia, as a devout Catholic and fearing for his soul, Tosca places candlesticks by his corpse and a crucifix on his chest. Dale replaced these with wineglasses and a bottle of wine – a highly improbable and puzzling act. 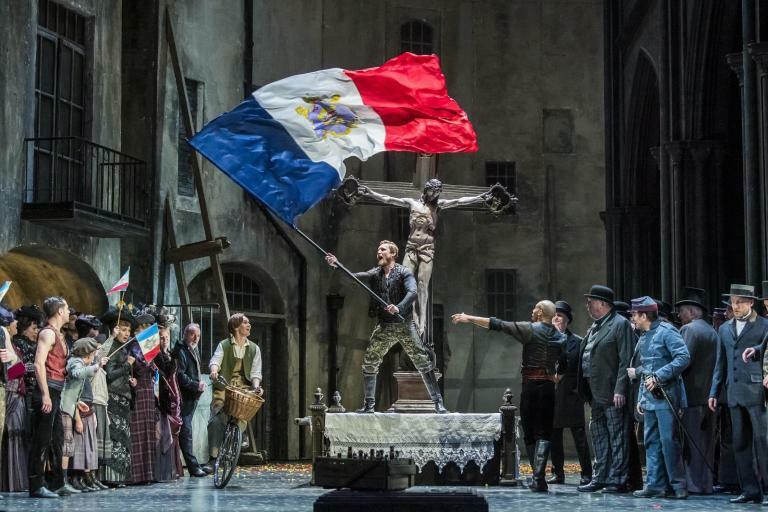 The hugely-anticipated finale of Tosca’s suicide was handled cleverly though: with not a battlement in sight, Dale’s decision to have Tosca fall into the arms of waiting angels was both a pragmatic and moving solution. The cast were admirably supported by an orchestra of 14 in a reduced arrangement by Francis Griffin. At the helm, William Conway led his superb musicians through a musical journey that was nuanced and sensitive, creating drama where necessary and lyrical softness during the more tender moments of the opera. There were times, however, when certain singers could not be heard, but that was probably a tricky situation to handle, given the unevenness in the vocal strength of the cast. The orchestra were a vital component of the evening’s success, as were the surtitles which greatly aided the audience (some of the singers’ diction was not always consistent or clear). A small chorus, ably led by Elizabeth Franklin-Kitchen, sang with great heart and helped bring Act I to a thrilling climax. All in all, it was an exhilarating evening and an impressive achievement by Everybody Can! Opera, in particular Nadine Benjamin who led the way in showing that ‘Everybody Can!’ And did.